I know I’ve been absent lately, but I have been making bread every day as I’m supposed to; I just haven’t been writing about it. I will make up the previous posts for this week as I’m able, but I just had to post today about the bread for today. Today is the day after Thanksgiving, known as Black Friday to the Good Capitalist in all our hearts; but to me, it’s got a very different meaning. Today is the day when I sit at home in my pajamas, laughing at all those who dare venture to any place of mercantilism, make eggnog, and put up the Christmas tree. As soon as the weather turns cold, I begin to feel the excitement for this day building within me. Growing up in New Orleans, the entrance of cold weather usually coincided happily with this day; but now living in Chicago, this means that I start to get excited to put up my little tree in about mid-September. The wait is excruciating. Since I was in high school and my Mom happily turned over decorating-the-tree duties to me, it has been a tradition for me to haul the musty boxes out of the attic, unravel the lights, checking each strand for outages, hand-pick the ornaments pretty and beloved enough to occupy the prime real estate on the front of the tree, and generally make a huge mess with the tinsel. This wholly unnecessary and entirely joyous work happens over a background of Christmas movies repeated ad nauseam on the television, until I get sick of hearing the same lines over and over, and put on Christmas music instead. But the most important part of the day, for me, is the eggnog. Sweet, thick, rich, and eggy, it’s the sort of drink that I abhor every other day of the year; but it’s one that I dearly look forward to having on just this one day. Having tried many types, there’s only one commercial brand that I’ve found acceptable, but homemade is absolutely, hands-down, no question the way to go, and always with a generous garnish of freshly grated nutmeg on top. I’ve written my go-to eggnog recipe below, which produces a sweet, half-rich, boozy, and full-flavored eggnog. The eggs in it remain uncooked, so if you have concerns about that, the Joy of Cooking contains a cooked eggnog recipe that is quite good as well. In the spirit (no pun intended) of the day, I’ve created a bread based on this beloved drink, and using the nog I was going to make anyway. It uses eggnog as the majority of the moisture, with walnuts added for body and crunch. 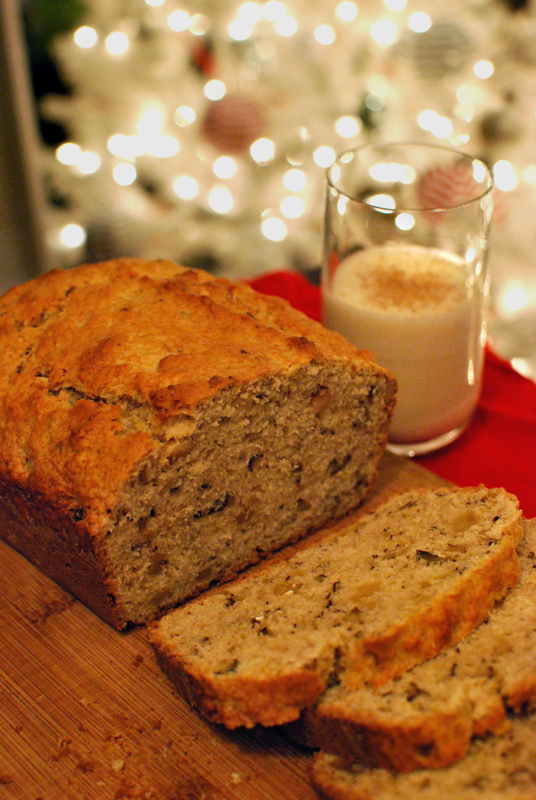 This bread has a decidedly eggy flavor, deepened with the bourbon, brandy, and rum in the nog. But no eggnog (bread, drink, or otherwise) would be complete without the nutmeg, and it’s here in spades. I’ve used a suitably heavy hand with it, bringing a bright warming spice to each bite. This loaf is sweet, rich, and full-flavored, just like the drink that inspired it. It slices easily, and is superb when toasted, especially with a lashing of good butter for an indulgent breakfast or snack on these chilly days. One taste of this tender bread, and you’ll be converted, even if you’ve never liked eggnog before. Well, at least for one day, you will. 1. Preheat the oven to 350º F. Butter a 9 x 5 inch loaf pan. Add a spoonful of flour, shaking around to coat the entire inside of the pan. Knock out the excess flour. 2. Spread the walnuts in a single layer on a sheet pan, and toast in the oven for 5 to 8 minutes, or until fragrant. While still warm, chop, and set aside to cool slightly. 3. In a medium bowl, whisk together the flour, baking powder, nutmeg, salt, and baking soda. 4. In a large bowl, or with an electric mixer, whisk the egg with the sugar until pale yellow and thick, 3 to 5 minutes. Whisk the butter in slowly. Stir in the eggnog. 5. Add the dry ingredients, and fold in gently with a spatula until the flour is mostly moistened. Add the walnuts, and fold in until no more pockets of dry ingredients remain. Scrape batter into the prepared loaf pan, and smooth the top. 6. Bake at 350º F until golden brown and the loaf feels firm when pressed gently in the middle, about 45 minutes. Let cool briefly in the pan, about 5 minutes, before transferring to a wire rack to cool thoroughly before slicing. 1. In a large bowl, whisk the egg yolks until light in color and fluffy, about 3 minutes. Slowly whisk in the powdered sugar. Mixture will be thick. Gradually whisk in the bourbon, beating constantly. Cover and let stand at room temperature for 1 hour to dispel the eggy taste. 2. Add the rum, brandy, cream, and milk to the egg mixture, and whisk to combine. Cover again, and refrigerate for 1 to 3 hours. 3. Using an electric mixer, beat the egg whites until medium-stiff peaks form. Add to the other ingredients, and fold or gently whisk to incorporate. Serve portions with a generous grating of fresh nutmeg. 1. Nutmeg loses its flavor very quickly after being grated, so I highly recommend grating your own whenever possible, especially as garnish for drinking eggnog. It’s hardly any trouble, and the incredible flavor is more than worth it. 2. I created this bread recipe based on the sweetness, booziness, and egginess of the above eggnog recipe. If using store-bought eggnog, you may want to increase or reduce the amount of sugar, and perhaps replace some of the amount of eggnog with brandy or rum.